Yesterday, November 7, 2015 -- a date which will live in infamy -- the United States of America was suddenly and deliberately attacked by Twitter and other social media forces of the Empire of Christmas. The United States was at peace with that holiday and, at the solicitation of various merchants, was still in conversation with its Elvin representatives and Santa Claus looking toward the maintenance of peace and plentiful gifts from the Arctic. 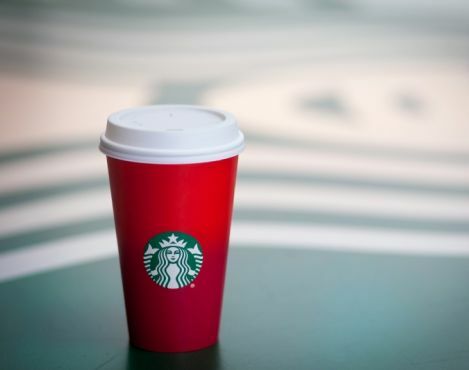 Indeed, for two weeks after Starbucks baristas had commenced distributing plain red cups, the propaganda instruments for the Empire of Christmas lay silent. And while this silence did not implicitly state that it seemed trivial for Starbucks to cut printing costs by removing a few snowflakes and the like from some beverage containers, it contained no threat or hint of Culture War or of social media attack. It will be recorded that the distance from the nearest Starbucks to immediate internet mob-fueled outrage makes it obvious that Planck length is not, in fact, the shortest measurable distance. Even so, the culture warrior allies of the Empire of Christmas deliberately sought to deceive the United States by false statements and expressions of hope for continued cultural peace. The attack yesterday on social media has caused severe damage to American humor and journalistic integrity. I regret to inform you that very many American likes and shares have been lost. In addition, American sighs have been reported torpedoed on the high seas between Facebook and Instagram. For decades the Empire of Christmas has claimed, time and again, that the American people have been at war with it. For decades both the people and the political leadership of America have routinely and without objection denied this claim. On our careful, wary watch, Christmas has annexed November, October, the Sudentenland, and part of September. Now Christmas demands Labor Day and the Free City of Danzig. For too long we have appeased this irredentist regime. For too long we told ourselves there would be peace in our time. America shall have no more of it. The line must be drawn here. We shall hold this ground. I move that this blog welcomes the formation of a movement representing the united and inflexible resolve of the nation to prosecute the war with Christmas to a victorious conclusion. We have before us an ordeal of the most grievous kind. We have before us many, many long weeks of struggle and of suffering. You ask, what is our policy? I can say: It is to wage war, by social, commercial and satirical, with all our might and with all the strength that God can give us; to wage war against a monstrous tyranny, never surpassed in the dark, lamentable catalog of human attention deficit disorder driven clickbait. That is our policy. You ask, what is our aim? I can answer in one word: It is victory, victory at all costs, victory in spite of slight annoyance, victory, however short and ephemeral the road may be; for without victory, there is no survival. Let that be realized; no survival for the pre-Christmas season, no survival for all that the refusal to wear red and green at the same time has stood for, no survival for the urge and impulse of the ages to not gorge incessantly in the commercial spirit of Christmas, that humankind will move forward towards its goal. But I take up my task with buoyancy and hope. I feel sure that our cause will not be suffered to fail among men, women, deis, magis, sagits, kyuus, toks, feys, firs, virs, xirs, thons, zirs, and other assorted otherkin. At this time I feel entitled to claim the aid of all, and I say, "come then, let us go forward together with our united strength, at least until something else distracts us five minutes from now." So come then, let us go forward together! Together our boots shall march on the North Pole by December 25th - if not this one then the next, assuming we don't forget about this before then! Together, with solidarity, we shall rise up and defeat the Jolly Green & Red Menace! For liberty! For fraternity! For equality!